This includes the stripping of fiber claddings, the cleaning and cleaving of fibers, and splicing or polishing, depending on the application. Microscopes and/or interferometers are used in the analysis of fiber end surfaces. We have tools available for all stages of processing, both for field applications and applications in the laboratory. We cover the entire range of fiber diameters to 1.2 mm. 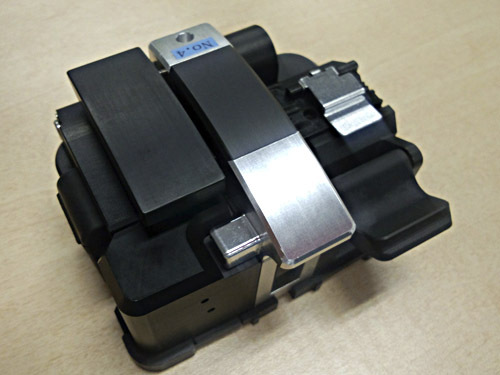 Fiber optic cleaver for telecom and datacom applications. 125 µm fibers are commonly used in telecom and datacom applications. Compact cleavers can be used to cleave the fibers when working in the field. The FK11 and FK12 models are ultrasonic cleavers that produce fiber cleaves with very small tolerances. Battery operation makes them suitable for application in the field. The high-precision optical fiber cleaver S326 from FITEL is lightweight and has an ergonomic design. This fiber cleaver is easy to load and operate and offers a user the flexibility of cleaving at a workbench or in the palm of your hand! 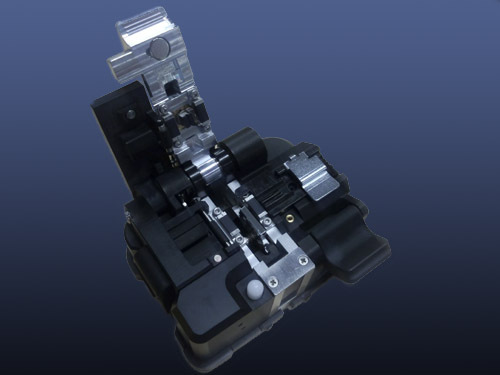 It can be used for all fiber types from single to twelve-ribbon fibers with a 125 µm clad diameter. The smallest fiber cleave tool in our range of products, the S315, is also referred to as the “clicker” because fibers can be very easily broken without having to set it down. This tool is designed for the cleaving of single fibers. 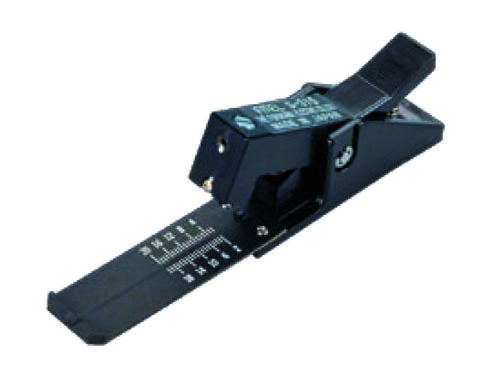 It has an integrated scale used to set cleave lengths between 5 mm and 20 mm. The S315 is an inexpensive and easy-to-use cleave tool for application in the field. It should not be used for fibers that are meant to be spliced. Ultrasonic cleavers for optical fibers produce even fiber breaks irrespective of the person handling the tools. These cleaves are highly precise and thus perfectly suited for high-strength splices. Both of these ultrasonic cleavers can be battery operated and are thus well suited for use in the laboratory as well as in the field. The FK11 cleaver breaks fibers with diameters from 80 µm to 200 µm, and the FK11-LDF (large diameter fibers) breaks fibers with diameters from 180 µm to 400 µm. This model is able to break through the polyimide coating of fibers. For many applications, it is thus not necessary to remove the hard coating in an elaborate process to produce a clean break. Using the FK12 cleaver, it is possible to perform breaks at an angle between 0° and 15°. Angled cleaves are used to prevent back reflections. The angle is adjusted via torsion forces that facilitate a high reproducibility.